Host your own Downton-inspired dinner party for your chance to win an overnight stay at Highclere Castle. Our annual Charity Event will be taking place on the 8th & 9th September 2018. On July 1st 2018 Highclere will be celebrating Canada with our “Constitutional Walk”. In one of the best moments in Downton Abbey, it was finally Lady Edith’s turn to stand at the top of the Oak Staircase here in the Castle as, full of excitement and nervousness, she walked down the stairs, her father and Carson looking proudly on. She was finally getting married. Of course, it was not the first Downton wedding. Lady Mary had married twice, Anna and Bates just the once and Carson and Mrs Hughes had finally realised what we knew all along – they would be a perfect match. In reality I, and most of my predecessors, were not married at Highclere. Almina, the 5th Countess, and Catherine, the 6th Countess, were both married in St Margaret’s Westminster, a beautiful church next door to Westminster Abbey. Geordie and I were married at the Savoy Chapel, a gem of a chapel tucked away behind the river which is still part of the Duchy of Lancaster and, as such, is a royal peculiar, (a word from the Latin peculium ‘property’) meaning under the jurisdiction of the reigning monarch rather than a bishop. It is an old building, simple and restrained in design but with an extraordinary and ornate ceiling with quatrefoils. In 1945, just before the end of World War Two, Geordie’s aunt Penelope did marry from Highclere. It was not a large wedding but a very happy one, a time of rationing, of making do, of pooling resources and of using flowers from the gardens. 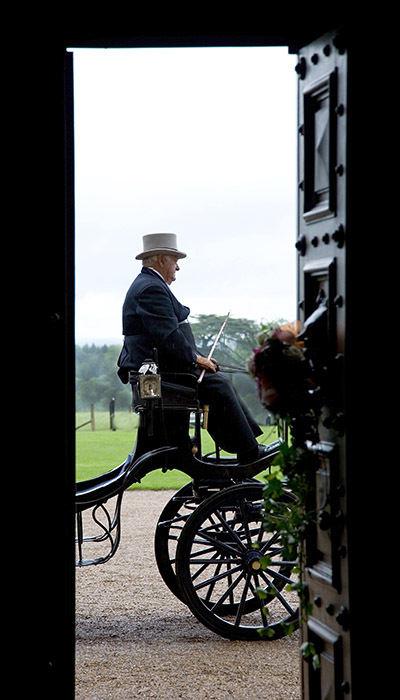 Today, Highclere is approved to hold civil marriages and civil partnerships and Lady Edith could now get married in the Saloon, although what is more charming than a horse and carriage to the church. “Horse and Carriage” is cockney rhyming slang for marriage and you walk down the “Apples and pears” (stairs) whilst most couples arrive and depart in a “jam jar” (car) rather than a Charing Cross (horse). Geordie and I return to the Savoy Chapel each year around Valentines’ day to be together and to remember our wedding. It is a wonderful service and, partly because it has become so special to us, we have in turn created an annual Valentines event at the Castle. We have even had a few engagements. It is always a moving moment. One such who stands out particularly in my memory was a serving soldier who had spent some time away on active duty and was so determined to make everything perfect. It was very moving for us all. 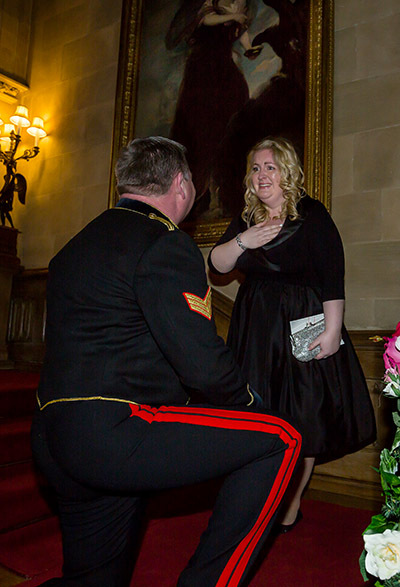 … Of course another, rather famous, ex-soldier is getting married this coming weekend and everyone wishes him and his American bride much happiness together. Churchill wrote : My most brilliant achievement was my ability to be able to persuade my wife to marry me.” I always thoroughly enjoy reading Churchill! Ok, now I want to get married again! Of course you’re right; the Savoy Chapel is lovely. It’s reputation, however, has changed somewhat over the years. That said?…….I never hear it mentioned without recalling Lady Julia’s account of her wedding to Rex Mottram: “Oh, it was a pokey little affair at the Savoy Chapel”. 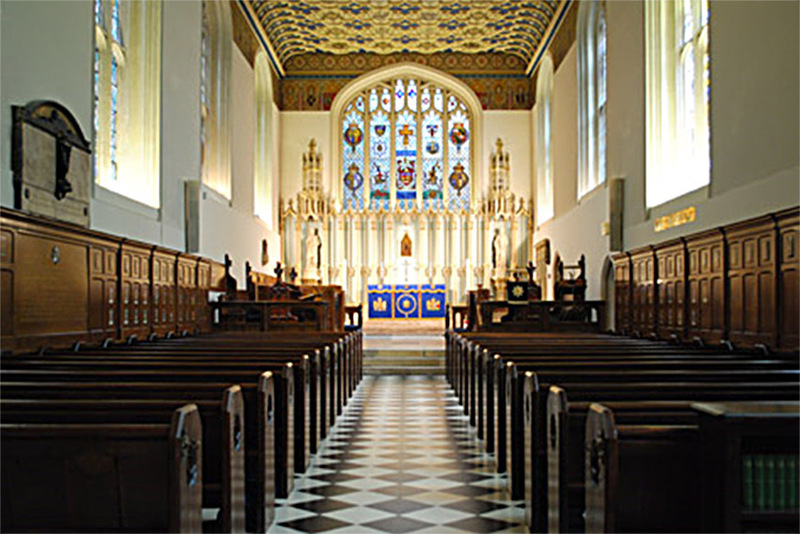 Imagine…..a lapsed Roman Catholic (the daughter of an Earl) marrying a Canadian divorcee….where better could they reasonably expect, in 1924, other than the Savoy chapel? Certainly, royalty or the girl’s Momma) would not be attending such a louche and misbegotten alliance. It’s all amusing when you consider it….and this is being written a man whose webmistress recently got married to her boyfriend-of-12-years by an Elvis impersonator in Las Vegas. Only in America…. Lovely article, enjoyed it very much! As I have visited the castle and secret garden, I can picture it in my mind. Thanks so much for keeping us all in the loop of the history of Highclere Castle! I really do not how to ask this question, so here goes! Is it your blood line, or your husbands who carries the Carnarvon tradition at Highclere Abbey? My husband’s family is “Carnarvon” and have lived here for 350 years. We are now the 8th Earl and Countess…. Wonderful blog entry as always. I am so excited to be actually seeing your beautiful home in person next Monday May 28th! It will be a dream come true to be able to walk through some of the rooms that I have seen in my multiple viewings of the Downton Abbey series. See you next week! That was interesting reading. I understand that a wedding venue needs to be approved and considered civil if not in a church? Lovely pictures! Thank you for sharing. A beautiful tribute to unions and celebrations, past and present. Yours is a very special story. What a delightfully appropriate blog with the forthcoming Royal Wedding taking place on Saturday. I thoroughly enjoyed your rhyming slang. I wonder how many grooms these days wear a kettle and hob? And each man should remember to complement his trouble and strife about her Barnet Fair or else they will end up Jack Jones. And without a wife’s cooking its onto the dog and bone to order a Ruby Murray. I think you have amused us all – I am usually torn between Winnie the Pooh and Winston Churchill for quotes! 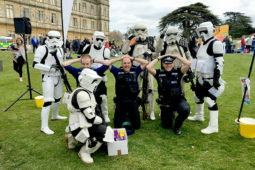 My first visit to Highclere was in 2014 for Heroes at Highclere Day. As I stood at the top of the oak staircase,I relived the scenes from Downton Abbey, especially Edith’s wedding and the veil floating down afterwards. Highclere is such a lovely venue for a wedding and to visit. Thank you Lady Carnarvon for another wonderful story from Highclere. Thank you for painting a lovely picture! I hope people will return or come for the first time to Heroes 2018 – it marks the last visible touchstone of a war which changed the world. Thanks so much for this mervellous article. Will you be among the guests at the Royal Wedding this weekend? I have never met the couple but just like everyone else wish them all the best and of course they really will be in a horse and carriage! What’s beautiful pictures and lovely stories about love and marriage on today, my birthday! What a beautiful venue is Highclere for such an event! I have visited and loved the house & grounds and can imagine it filled with wedding flowers and brides, as in times past. Am quite looking forward to the royal wedding this week, only wishing his mum could be here to rejoice in her sons happiness, and not just from afar! Love and happiness to all on such a joyful occasion in May! Always a joy the hear about the goings-on at Highclere! December 2017 a friend and I had the pleasure of attending your Christmas market, it was a special privilege to see the “real thing” after being welcomed into your home on every episode of Downton Abbey! I commend you on your dedication and work of preserving history in your corner of the world! And, Hello from Canada! I just love the Christmas market – it has become a much looked for event! Nevertheless the sunny weather today promises spring flowers! Thank you for sharing the lovely photographs. The 1920’s dresses are just so lovely, and the photograph of the bridesmaids with the wind just blowing their dresses slightly is so full of life. So soon after the horror of WWI it must have been a wonderful day, full of hope and glory. A very appropriate and timely post as the royal wedding is coming around on Saturday. Highclare is the perfect place for a beautiful and exotic wedding trimmed with all the fancy frills and fur-bellows. English history is my passion and therefore I watch Downton ad nauseum. Thank you for bringing the past back to life so vividly. Thank you for bringing the spring season to life. “Downton Abbey” reminded a massive audience of the dramatic appeal of “taking the high road” when historically accurate. 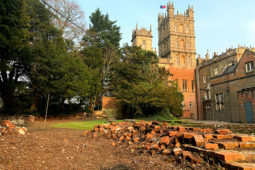 Instead of the mandatory nonstop violence media code, the producers aimed at joining Highclere architecture to the subtle poetry of period family values and fortunately, they succeeded. A tribute to Highclere’s talented owners and their team. Thank you! Loved the post and the pictures! Thank you for sharing. ding dong the bells are goin’ chime” on May 19! Always a glorious time when there’s a Royal Wedding, as that every wedding is indeed a royal event. 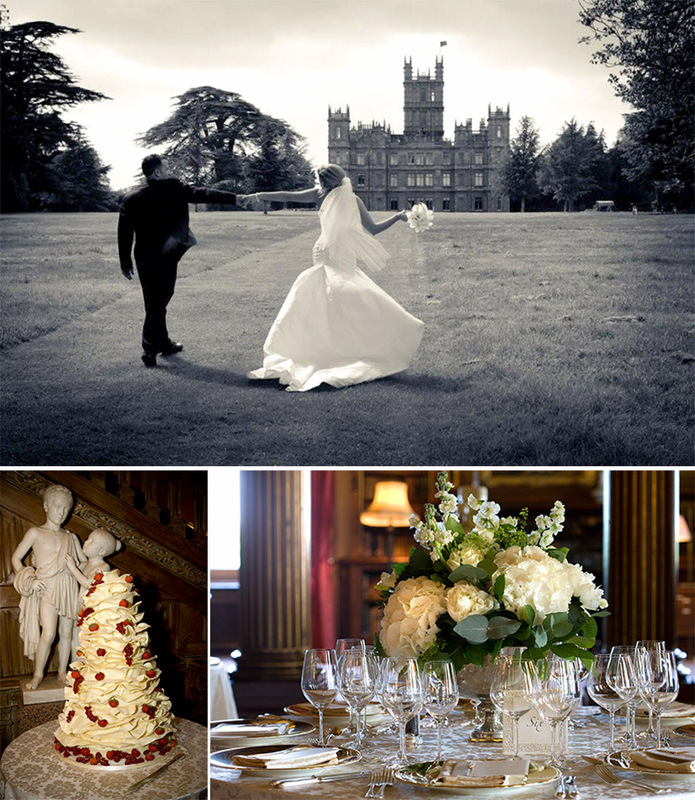 I have seen several posts on the internet by couples who had their weddings at Highclere and how beautiful they are! 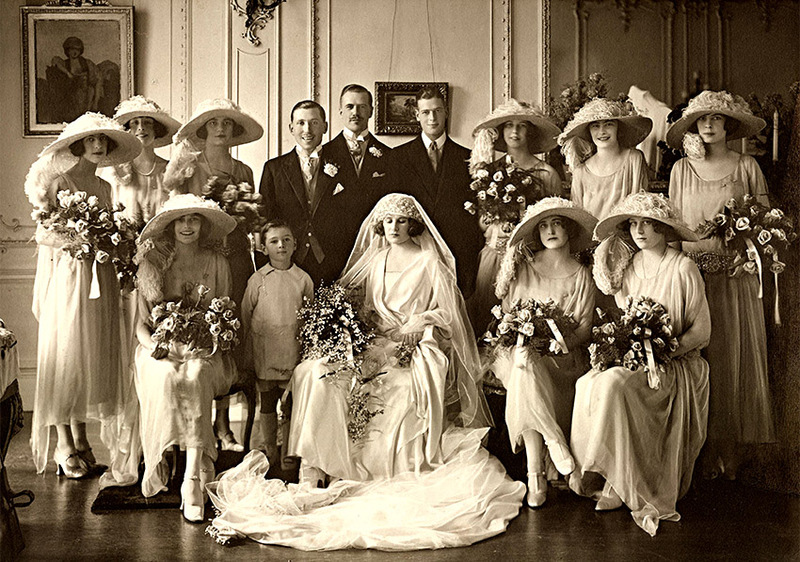 Thank you for this very “loverly” post and going back in time to Lady Catherine’s wedding in 1922. 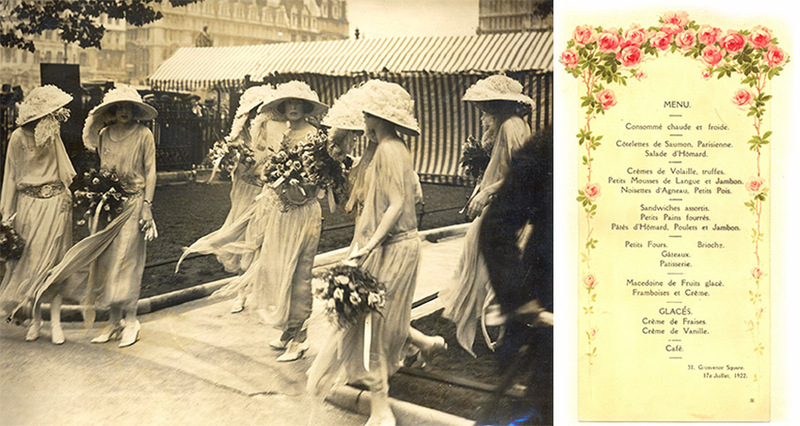 The clothes and hats from the above 1922 wedding were just so lovely – so elegant. Loved hearing about the weddings – and yours! That staircase is so grand! I went down it with my husband several years ago as tourists! For a moment, I imagine it was only us descending it! What a fun moment! Are you attending the upcoming royal wedding? We Americans will enjoy it via television! It should be fabulous! Dear Lady Carnarvon, another wonderful blog that set me to researching the people and places named. Thank you so much. My birthday is Feb 14th! Cockney terms for things were/are so unfathomable, so bewildering, I believe they were used in WWII as unbreakable “coders” on the battle field. Am I right? Not unlike the Navajo Indians in the Pacific and some Slavic language speakers. Am I right the author, Mr. Fellows, is related to the Herberts? I see the name in my genealogy. Same family? Thanks for having your assistant get back to me. Nice to have the spell check here. Well, it’s me again, from America. I plan my Monday around making time to read your blog. You have out done yourself this week! In the past I was a wedding planner and a Florist. So seeing these glorious pictures from the past weddings was a joy for me. Do you have any idea what color the dresses were? I loved seeing the gowns billowing in the wind. It made the scene very ethereal. I could close my eyes and feel the outside breeze as it was drifting past the Wedding Party. I have a ‘Lady Carnarvon Blog’ designated folder on my computer where I save the wonderful pictures you so generously share with us. My Husband and I are trying to make a way to attend the Heroes at Highclere weekend in September. I think it would mean a lot to him especially. Vietnam Veterans were not welcomed home to the US properly at the time in the late 1960’s. So these events help in the healing process that is still taking place. I am so grateful for the tips on the special Churches to visit should we be able to make it there for the event in September. Thank you. I’m making a list of places to see including the ones I have discovered in my ancestry story. I only hope I will be able to meet you and thank you in person. Keep up the good work! I’m enjoying your words so much! Love reading the articles. Highclere has a special place in my heart as I was married to my Army officer at Highclere Church in 1985, my girls were all baptised there and my parents are buried in the peaceful cemetery in the grounds of Highclere Park. Love coming back for a visit. Wow! How Blessed you are to have Highclere play such an important role in your life! I’m a bit envious! It would be nice to be able to pop over for a visit! How lovely – are you coming to “Heroes”? Perhaps you might share a few wedding photos of you and Geordie for us? I might add them ! Wonderful blog your Ladyship and so apt for today; as my wife, Alison and I are celebrating our 13th Anniversary. We are both massive Downton Abbey fans and are Looking forward to visiting Highclare on July 23rd. I love your posts. Thank you for keeping history alive and so, so fascinating! I immensely enjoy your stories, of both the present and the past, which often lead me to witness higher levels of human spirit than I thought possible. Thank you for the gift of your time that you have given to all of us, your readers. Beautiful article!! I can’t imagine a more glorious setting for their wedding. I’ve been following your blog for almost a year now and truly look forward to each article. I am coming to visit on May 29th and am so excited to see you and Highclere. I thought I read on your blog what the inscription over th front door says but can’t seem to find it! Would you please tell me the translation? What beautiful photos and memories! I am very excited about the Royal Weddingand will be up late watching from Australia and will have my British flag flying and some champagne flowing to toast the happy couple. I loved this blog, thankyou for sharing. Wonderful images and stories of weddings past and weddings future (this weekend!). I’ve always admired the wedding portrait of Almina, 5th Countess. I first saw this image in your book, and then again inside Highclere. But I have wondered why her eyes are closed? Would not the photographer have taken more than one photograph at the time, and so be able to select a beautiful wedding portrait with the Countess’s eyes open? Looking forward to our third visit to Highclere in July! Thank you for a great blog… I always feel like Alice in Wonderland reading it! Thank you for your informative and charming blog. Three years ago this month I was fortunate to tour Highclere with a group of friends. We love to reminisce about that day. I look forward to the next time. I loved your Churchill quote and coincidentally today I just finished reading “Clementine” a biography of Clementine Churchill. 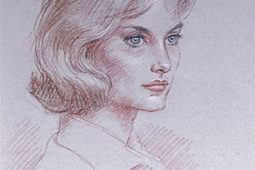 I did not too much about her and was fascinated by her dedication and devotion to both Winston and to England. I am so enchanted by your tales of the weddings in and around Highclere Castle. I had forgotten that Lady Almina and Lady Catherine were both married in ceremonies outside Highclere. I think the venue you had for your own wedding, Savoy Chapel, is charming. I think it is lovely that so many couples come to Highclere for their wedding ceremonies. It occurs to me that the village church, St. Mary’s, is probably besieged by wedding requests for potential Matthew and Marys!!! Happy Wedding Day to Prince Harry and Meghan Markle. I am setting the table for my celebration brunch as I write this. I think the whole world celebrates their union, and my friends and I will enjoy a “wedding breakfast” and champagne toast for the Royal couple. May they have a long and happy life together!!! It is my wish to come in September. In June I will visite Your Castle for the first time! I can not wait to see your butifull Castle. The hats in the photo are divine. I recent saw Lady Carnarvon’s own wedding photo – blue velvet – oh yes!! So true Helen King – the hats are fabulous, how about reproducing them, I know a great milliner….. I have just discovered today on Ancestry.com, whilst researching my ancestors, that Edward II (Plantagenet), King of England was born at Carnarvon Castle in Wales, in 1284. He was my 16th Great Grandfather. Of course, the name of that castle caught my eye immediately, and got me wondering if this grandfather of mine was kin to your husband. Looking forward to hearing from you. Thank you kindly for a reply. Your home is ideal for weddings!